Simply put, you cannot duplicate the look of these walls on your own; you need help. And help is on the way in the form of textured 3D wall panels, an innovation that most homeowners don't know about. Formerly found only in fancy cocktail lounges and boutique hotels, textured panels are slowly finding their way into the home as cool, unique, and jaw-droppingly amazing wall coverings for kitchens, living rooms, and bedrooms. Pictured: Soelberg Industries' panel called Stillare, installed in the Pepperwood Residence, Sandy, UT. This lovely textured panel is from Soelberg and is called Piastra. Piastra comes in planks (Soelberg terms them slats) ranging from 4" x 12" all the way up to 6" x 36". The pictured panels are created from MDF and they mimic beechwood. But why not just use real wood? Wood is an option. But it's not without its faults, either. Even in interior applications, wood will eventually fade and require re-staining and re-sealing; Soelberg panels' finishes will last indefinitely. Cool, Sixties-Style Textured Wall Panels! How can you not exclaim! the wonderfulness! of these panels! at every turn? Shown here is the Caryota style of textured wall panel from WallArt 3D. The caryota is a type of fishtail palm, so named because the leaves resemble the tail of a fish. To me, this pattern looks like the starbursts you see so much of in mid-century modern (i.e., 1960s) style home designs. Panels from WallArt are made of bagasse, a light-weight sugarcane stalk material. So these panels are as green as they get, and leaps and bounds greener than MDF. WallArt panels stick to your existing wall with construction adhesive. One feature of 3D panels is flow, continuity. While you can get panels that stick on the wall in any direction, like WallArt's Caryota panels, another class of panels (from any of these manufacturers), matches up from panel to panel. The Flows collection shown here from WallArt has lines that link from one panel to the next, creating a unified appearance. It doesn't matter which panel you choose: it is guaranteed to match up with the previous panel (just make sure it maintains the same horizontal or vertical movement, though). WallArt 3D panels can be cut with a utility knife or light electric saw, such as a cordless jigsaw or circular saw. Due to the thin product material and hollow spaces created by protrusions, there may be concerns about the durability of the panels. Get a smashing vibrant purple wall with this cube-shaped 3D textured panel from Wall Dimension. These panels come unpainted, and you can color them anything you wish (paint sprayer recommended). Wall Dimension's panels are made of thin plastic vs. WallArt's plant fiber-based panels. Wall Dimension has a comparison chart showing how, at least in their opinion, plastic panels are better than fiber panels. Wall Dimension's panels self-stick to the wall with pre-applied adhesive. This is where you see the benefits of 3D wall panels: it's impossible to duplicate this look using any kind of 2D wall covering. The multiplicity of 3D yellow circles really makes this contemporary living room snap, crackle, and pop. From Wall Dimension, this pattern is called, appropriately enough, "Circle." This pattern is called Zelle and it's from Modular Arts, a high-end design materials company based in Seattle, WA. Where these panels differ from other panels is in the composition. The cheaper panels are made of plastic or plant fiber and are hollow. Modular Arts' InterlockingRock Panels are a cement-like, fibrous material that is dense, durable, and fire-resistant. Even so, it is relatively lightweight, tipping the scales at only 1.3 to 3 pounds per square foot. "Stream-style" 3D wall panels are the most popular out there, and those from Modular Arts are no exception. This one is a bit difficult to see (the panels are in the back, left), but you'll notice that the stream-styled panels are mounted vertically. Which begs the question: is it still a stream? Sure, it's just an upward-flowing stream. 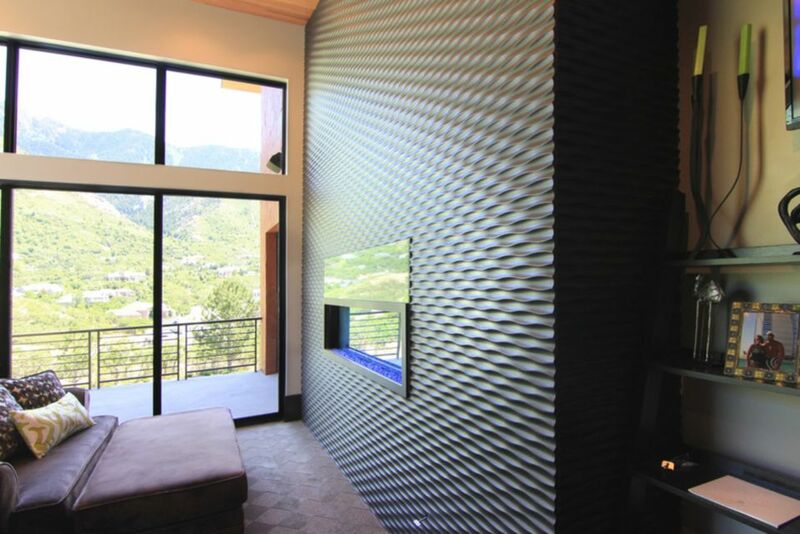 When looking for textured wall panels, no doubt you'll run into a company called Textures 3D. Company representative Carlos Alberto tells me that Textures 3D was one of the earliest companies to offer textured panel products. Starting in 2006, Textures 3D began selling a lower cost panel at a time when competing 4' x 8' panels went for $1,200. They were also the first to standardize industry terms by using the words "texture" and "3D" and trademarking these terms. How the seams of these solid panels (MDF vs. hollow plastic or bagasse panels) can be filled to visually obliterate the seam altogether. How they are best reserved for those one or two special walls, otherwise known as accent walls. Not only would it be too costly to panel every room in your house with this product, stylistically it just wouldn't work. How recessed (or "can") lights judiciously placed will highlight the panels' unique texture.